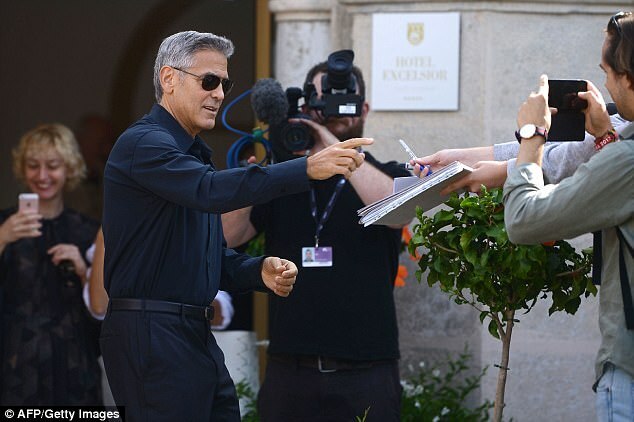 They are currently in Italy for the 74th annual Venice Film Festival. 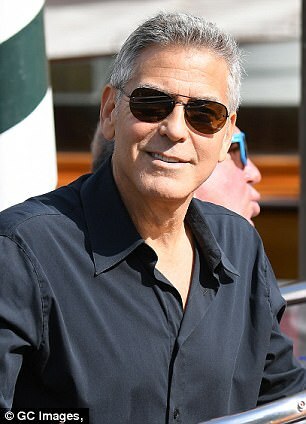 And proving the event to be a glamorous affair, Amal Clooney, 39, looked sensational as she stepped out to support her actor husband George, 56, on Friday. The mother-of-two who has been showcasing her incredible post-baby frame, after giving birth just three months ago in June, dazzled in a glittering royal blue bandeau dress. 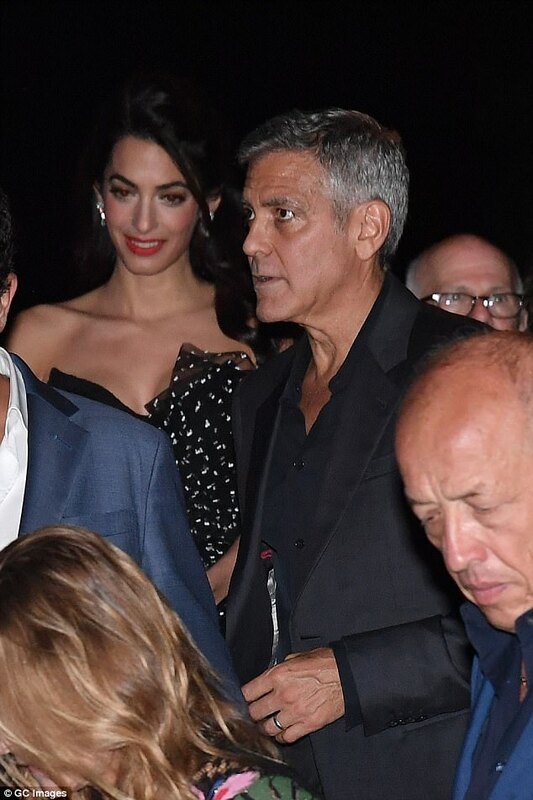 Amal's stunning frock was certain to turn heads as she made her exit from Ristorante Da Ivo in the Italian city - where she and George had previously wed in 2014 - after dining with her beau and his A-list pals, Matt Damon and his wife Luciana Barroso. The brunette beauty put on an elegant display in the fitted number that sheathed her figure, nipping in at the waist, and teased a hint of cleavage with its low-cut neckline. It also boasted a layered frilled skirt that reached down to the starlet's feet, with Amal adding height to her ensemble in a stylish pair of bronze cut-out heels. She accessorised with a pair of jewelled statement earrings, sweeping her long glossy locks over to one side while ensuring to keep them on show. Her tresses were styled into soft glamorous waves and Amal completed her evening look with a slick of bold red lipstick across her lips. 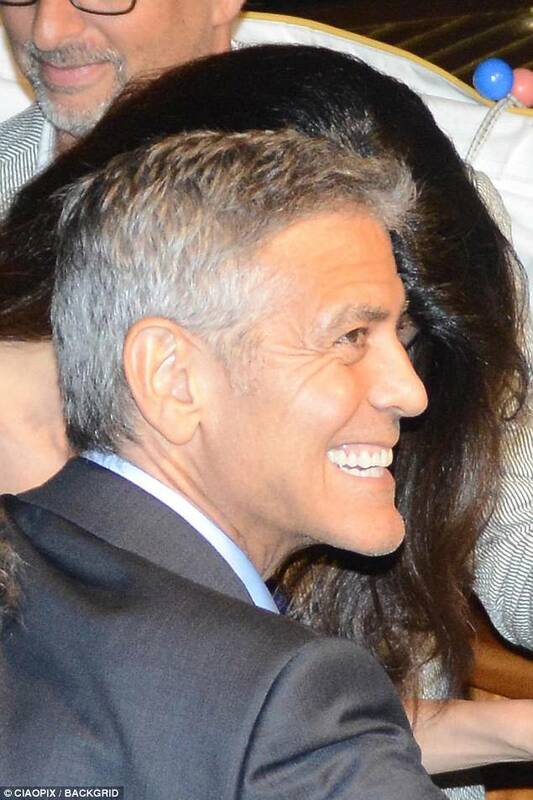 The barrister appeared in high spirits as she headed home with her Ocean Elevens star spouse, with a suit-clad George making sure to clutch onto his wife's arm to aid her exit. 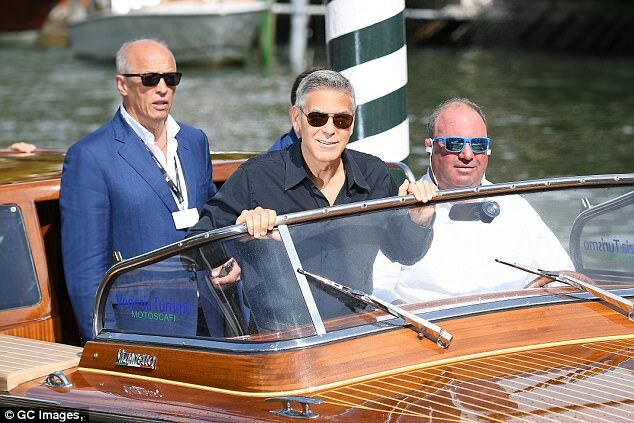 Their appearance together in Venice comes as George is busy preparing for the October premiere of his new thriller Suburbicon which he is directing, which stars Julianne Moore, Matt Damon and Oscar Isaac. Suburbicon peers into the dark racial tensions of 1950s suburbia, which the actor believes is deeply relevant to Donald Trump's America. George addressed the life-changing three months he has had since welcoming his brood, as he added: 'Right now my job is changing diapers and walking them around a little bit. I really didn't think at 56 that I would be the parent of twins. The Berkshire-based couple had welcomed their twins; daughter Ella and son Alexander in June, with Amal giving birth at London's Chelsea and Westminster Hospital. 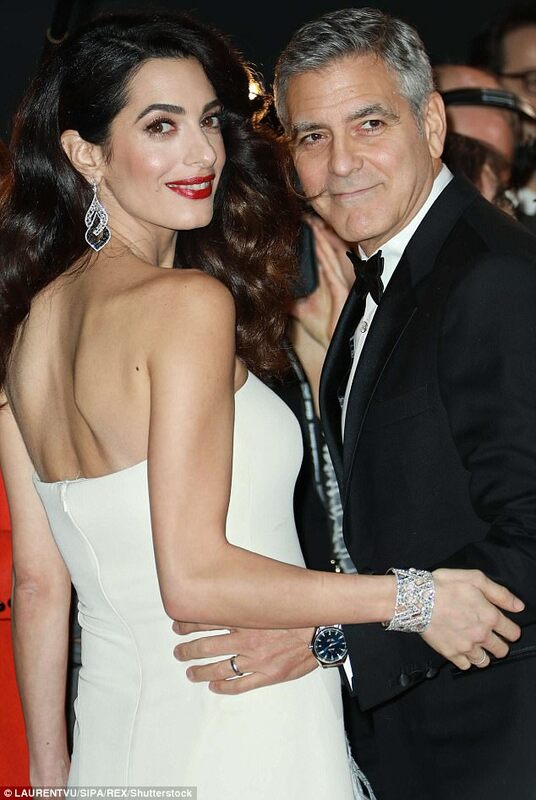 George and Amal are believed to have paid up to £8,520 ($11,000) for a private suite in the Kensington Wing according to a Tuesday report from the Daily Mirror. Nick Clooney, George's father, gushed to Entertainment Tonight following the twins' birth that his grandchildren were 'wonderful'. 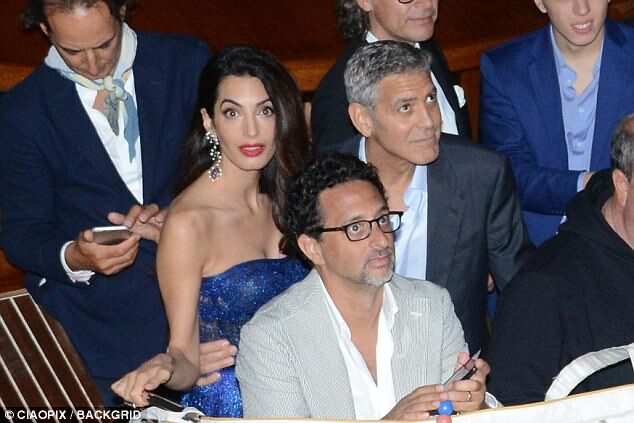 Amal's mother, Baria Alamuddin, meanwhile, had told People that meeting her grandchildren for the first time had been a 'beautiful feeling'. 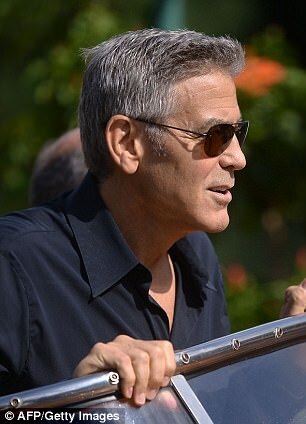 George had married Amal, née Alamuddin, back in September 2014, in Venice, after meeting at a charity fundraiser the previous year.